A couple of months ago, I had my first ever encounter with Korean food in a little restaurant in Prague. I generally love Asian food, but I’d always heard that Korean cuisine was very heavy on meat and light on vegan options and I’d never stumbled across any restaurants that offered it. So I was really pleased to see this place listed on Happy Cow, and they replied really quickly to my Facebook messages to let me know which dishes were vegan. I’d also heard that Korean food was spicy, but somehow I didn’t think it would be as spicy as this! We got these little plates of food for our appetiser, and a glass of plum juice at the end. They told us all the dishes were meat-free, but I was only willing to gamble on the noodly one being vegan (the red kimchi one as well, but it was a touch too fiery for me!). Knowing absolutely nothing about Korean food, we relied on the pictures on the menu and chose things that looked guaranteed to satisfy. The vegetable duk bok gi (pictured at the top) combined boiled rice cakes (squashy cylinders of rice), deep fried sweet potato slices, a few delicious dumplings and vegetables in chilli sauce. The first few mouthfuls of the sauce were really flavoursome and nice, after that my tastebuds were burned and destroyed. Dr HH maintained that it had a good flavour throughout, so it depends on tolerance. The rice was worth getting burned for, and the sweet potato slices were exceptional in their good, light batter. 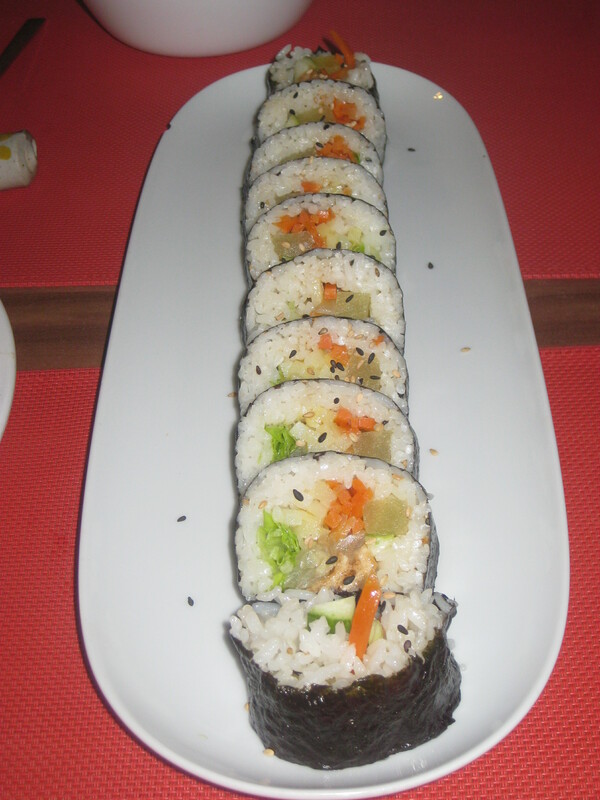 The vegetable kimbab was delicious: tofu, carrot, radish rolled up like sushi. It was good for putting out the fire in my mouth – very refreshing! There’s a sushi section of the menu with some vegan avocado or cucumber maki, but it was nice to try this Korean version for the first time. And dumplings! This dish was bibim mandu: the mandu are the little dumplings, which were crispy and perfect, like gyoza fried to crunchy perfection. The salad in the middle was extremely saucy, and that sauce was extemely fiery. I had two mouthfuls, and couldn’t touch it again. Dr HH loved it though so again, it’s all about tolerance. We both agreed that this and the vegetables in chilli sauce above would have been better with some rice to cut the heat a bit (Dr HH also lamented the lack of bread to mop up the sauce afterwards). We couldn’t eat everything, but we packaged up the leftovers to take home. Thankfully, this place has an open policy on tap water and we were able to keep the refreshments coming. The only downside is that the restaurant also serves meat, and some of the dishes are brought out to cook on the table, meaning that you’re surrounded by the smell of sizzling meat: not one of my favourite things. It really does depend on what the other diners order, so I wouldn’t let it put me off going back. Apparently I really need to build up my spice tolerance! 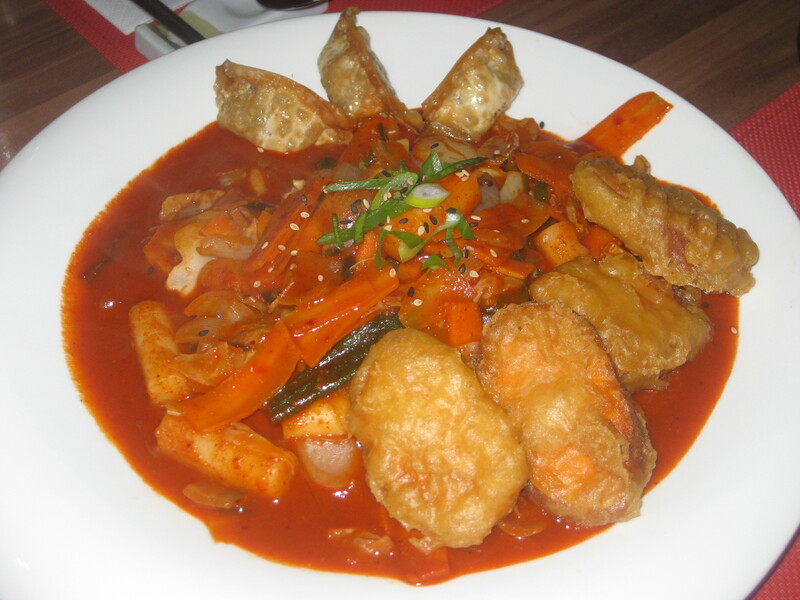 This entry was posted in Travel and tagged Mamy Prague vegan, vegan Korean, vegan Prague, vegan travel. Bookmark the permalink. Amazing! What a spread! Most of the Korean food I eat is generally made by me (with all that entails!) for the reasons you said – I always think of it as very meaty. 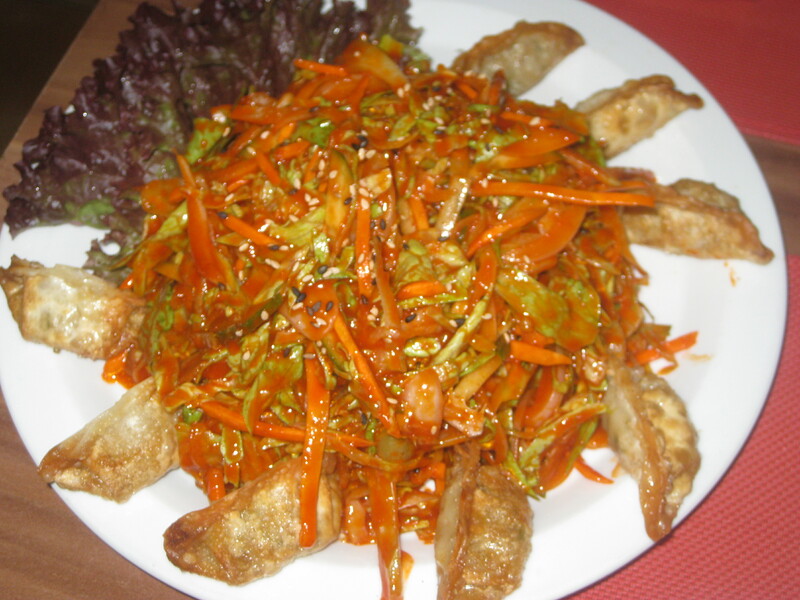 I’d be so delighted if I had a Korean meal like that – I would inhale the gyoza! The gyoza were excellent – it’s been a while since I’d had any that good. I should really look into cooking my own Korean food. At least then I’ll be able to control the spiciness! It is nice finding Korean food that is vegan friendly! I kind-of stopped going to my fav Korean restaurant because the options are so limited. 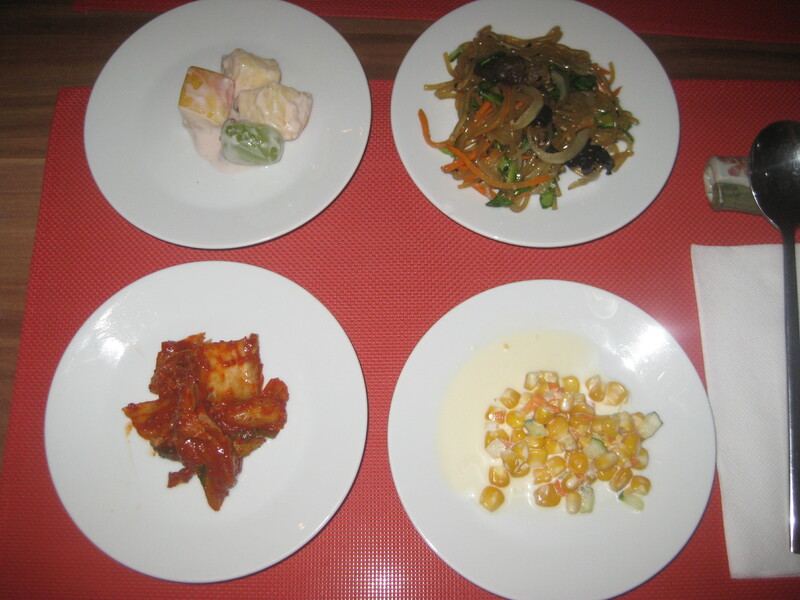 Which is some ways is weird since Korean food is very vegetable heavy, and seafood heavy. I think the country is starting to demand more meat as the country is getting wealthier. Bummer. Good point about the economy affecting the diet, that hadn’t occurred to me. It’s a shame the options are limited, this place actually had a pretty decent list of vegan options. My boyfriend is eager to go back and try some more, but I’m not sure I can handle the spiciness yet!